You can start a FaceTime video call in Messages. In the Messages app on your Mac, send a message to the person or group you want to start a video call with. Click Details, then click the Video button next to the group name or the individual’s name to immediately start the call. If you don’t see the Video button, you may need to sign in to FaceTime. You can choose which audio input device to use in Sound preferences and which camera to use from the FaceTime Video menu. 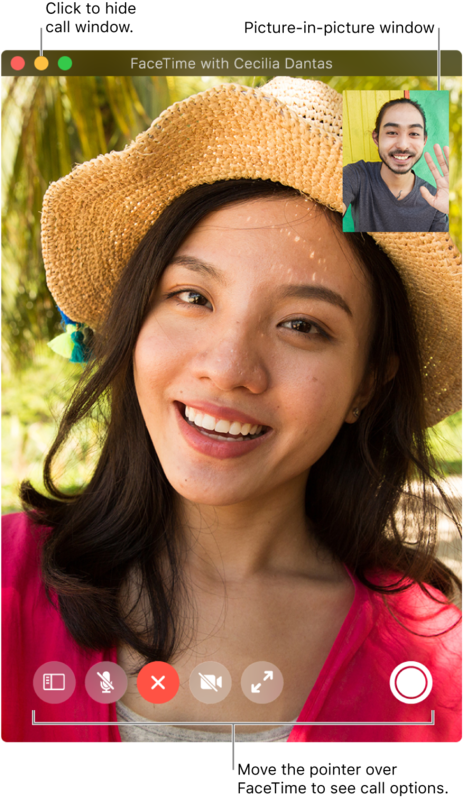 To start a FaceTime call using a different email address or phone number listed in your friend’s contact card, click and hold the Video button . When someone includes you in a Group FaceTime call, you can join the call from the transcript. Just click Join in the FaceTime message bubble. Group FaceTime is available with the macOS Mojave 10.14.3 Supplemental Update or later, or iOS 12.1.4 or later. This feature may not be available in all regions. See the Apple Support article About the security content of macOS Mojave 10.14.3 Supplemental Update. When someone who doesn’t have a camera answers a video call, they’re represented by a monogram and a sound level meter instead of video.